The eastern side of Indonesia is known well for its fascinating nautical highlight, especially the eastern most island of Indonesia. If you're visiting Jayapura, don't forget to visit this beach, Harlem Beach. Situated in Tablanusu village, Depepre district, Jayapura regency of Papua Province. Many have said that this is the most beautiful beach in Jayapura. The location is a bit isolated and the beach has therefore not been visited by many. You will feel here you are having fun on your own private beach. It's a white sandy beach with clear water and beautiful gradation. 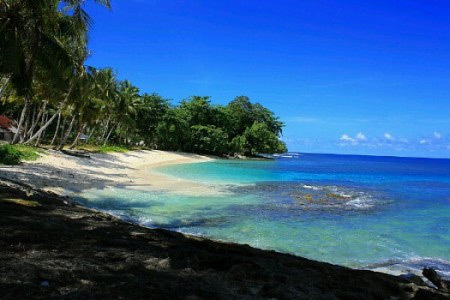 The waves are small as the beach is located in a bay, making it good place for swimming and snorkeling. You can see corals, fishes, and other sea animals while snorkeling. You don't have to go far out into the see these beauties as there are many who live close to the beach line. Beside snorkeling and swimming you can also try to catch some fish, play in the sand or just enjoy the scenery and solitude. There's a water pool near the beach used for rinsing our body after playing at the beach. It has fresh natural clear water. Harlem Beach is only accessible by sea. You need to go to Depepre Pier first, 48 km west from Jayapura or 22 km from Sentani. Here you can get a boat to Harlem Beach which will take only 15 minutes. You can rent a boat (it would need to wait to get you back again too) for IDR 300,000 - 400,000 which can carry approximately up to 10 passengers.